Dyan is currently studying a communications degree through Open University, and holds a diploma in Japanese language from the University of Borobodur. She has also had training in administrative and secretarial skills. Dyan coordinates the administrative requirements for researchers conducting fieldwork, seminars, conferences, and workshops, as well as acting as the first point of contact for SMERU. 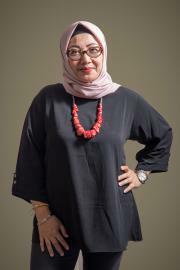 Prior to joining SMERU, Dyan worked as a marketing and reservation officer for Indah Tour and Travel and Garbarata Tour and Travel.